The Exchange has been in the business of disseminating information for over 140 years. Whether it's breaking maritime news, port statistics and schedules, navigational alerts, critical regulatory information, or community events, we are the central source for maritime information in the Delaware Valley. The Maritime Exchange tailors each publication to meet the specific needs of its members. Take a few minutes to review our products, and you'll see why the Exchange is the one-stop information shop. Contact the Exchange today at 215-925-2615 or exchange@maritimedelriv.com for more information. The Exchange serves as the distribution hub for the latest alerts and news from federal agencies, members, and the community. Members benefit from receiving current navigational alerts, regulatory changes affecting cargo ops and safety, system alerts related to electronic cargo and crew manifest filing, safety zones, hurricane and ice restrictions, and more. The Beacon is the Exchange's free quarterly newsletter exclusively dedicated to covering port issues and activities in the Delaware River region. The Exchange distributes each issue to over 5,000 maritime and trade professionals in Pennsylvania, New Jersey, Delaware, and throughout the country. The Beacon is available in print and online. The staff is grateful for the support and the many positive comments we have received over the years. Thanks to the advertisers who have helped make The Beacon such a success! With company budgets stretched to the limits, advertising dollars are precious to everyone. Give us a call today at 267-670-7948, send us an email, or download the rate sheet/contract to find out more about our low rates. Each year, the Exchange compiles an updated port directory, a comprehensive list of over 1,000 port and related businesses, associations, and agencies in the Delaware Valley. This handy reference tool provides valuable information including the addresses, phone numbers, and email and web addresses for contacts Exchange members need most often. Exchange members and advertisers receive complimentary copies. Advertise in the Port Directory! Advertise in the Maritime Exchange annual port directory, the most comprehensive contact resource for the maritime trade and transportation industry on the Delaware River! For more information about advertising with the Exchange call 267-670-7948 or send us an email. We’ll be happy to help you. Buchanan Ingersoll & Rooney, P.C. Deasey, Mahoney, & Valentini, Ltd. The President’s Report compiles the daily alerts and bulletins in a single publication to keep you abreast of legislative and operational actions, challenges and resources to help keep your business successful. This monthly publication provides a quick synopsis of legislative issues, funding initiatives, port events, regulatory changes, Maritime Exchange operational updates, and other information pertinent to the port community. The Exchange distributes the President's Report exclusively to our membership. Members receive the Federal Register highlights as part of their association benefits. Non-members can subscribe to the Highlights for $20 per month. Contact the Exchange at 267-670-7946 or complete and return the order form to subscribe. 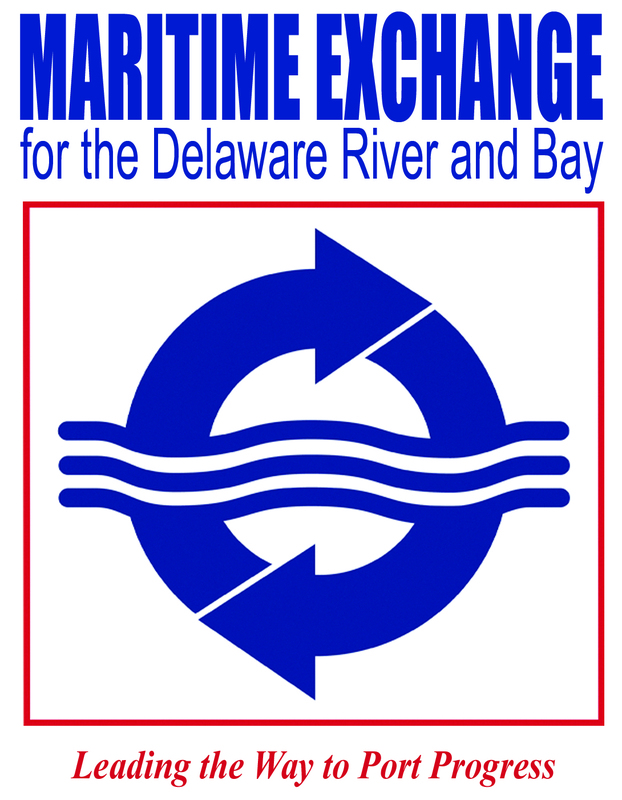 Maritime Exchange logo and banner artwork are copyrighted material and are owned exclusively by the Maritime Exchange for the Delaware and Bay, Inc. You may download the Maritime Exchange logo per the following usage policy. You may use the Maritime Exchange logo on your website, sponsor posters, brochures, and elsewhere to show affiliation with the Maritime Exchange. You may not use the logo or its likeness for any commercial purpose without permission from the Maritime Exchange. No wording or graphics may appear near the logo in such a way as to imply endorsement or approval of any kind without the express permission from the Maritime Exchange. The logo may not be used in a manner that would disparage the Maritime Exchange or its products or services. You may not alter the logo except for resizing. You must maintain the aspect ratio of the original artwork when resizing. You must maintain a reasonable amount of clear space around the logo. The logo must appear on a field of white. The Maritime Exchange posts Delaware River port community events to its calendar as a service to members and the maritime community at large. Members, associations, and organizations are encouraged to send information on their board meetings, committee meetings, workshops and seminars, and social events such as luncheons, dinners, receptions, and golf outings to the Exchange for inclusion in the calendar. Please include the event name, date, time, place, contact information, and frequency, if applicable. Maritime Exchange members are encouraged to send job opportunities for posting on our website. Job seekers with maritime backgrounds or who are interested in a career in the Delaware River maritime community are invited to send resumes.